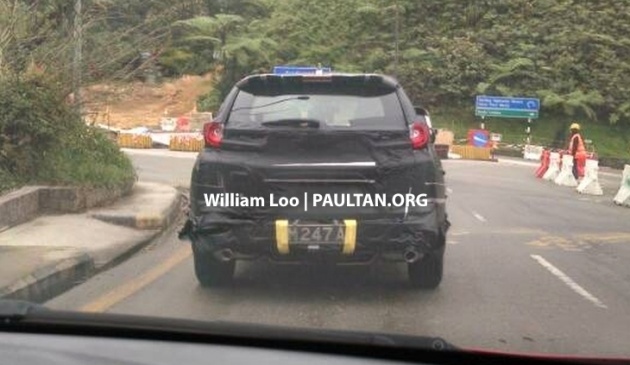 The 2017 Honda CR-V, first spotted here undergoing road trials in March, has been sighted again – reader William Loo saw this clad SUV going up towards Genting Highlands and managed to snap a pix of it. The mule is much easier to make out this time compared to the one seen two months ago, which was covered by a massive tarp while on the move. The rear form of the vehicle, as well as of the distinct tail lamp styling, leaves no question as to the identity of the car, and the twin exhaust tip layout reveals the evaluator to be a 1.5L VTEC Turbo. We already know that the Turbo is coming, and the Malaysian model line-up should resemble that seen in Indonesia – the fifth-generation SUV was launched at the 2017 Indonesia International Motor Show (IIMS) in Jakarta last month, and the two variant line-up for the republic is different to that for Thailand. Indonesian CR-V buyers get to choose from a five-seater 2.0 litre NA petrol engine and a seven-seater 1.5 litre turbocharged petrol engine (the Thai model line-up consists of a 2.4 litre NA petrol and a 1.6 litre i-DTEC turbodiesel), and both mills send power to the front wheels via a CVT automatic with steering paddle shifters. The 1.5 litre DOHC four-pot – which will form the basis of the range-topping model here – puts out 190 PS and 240 Nm of torque delivered between 2,000 and 5,000 rpm, while the familiar R20 2.0 litre SOHC NA lump offers 155 PS and 190 Nm.